Wonder Lake, and the Nippersink Creek stream channel downstream (east) of the Thompson Road Bridge, are owned by the Wonder Lake Master Property Owners Association (MPOA). Fishing is only allowed in these areas for those landowners holding deeded lake rights to Wonder Lake, or their guests, who must be accompanied by someone holding deeded lake rights. 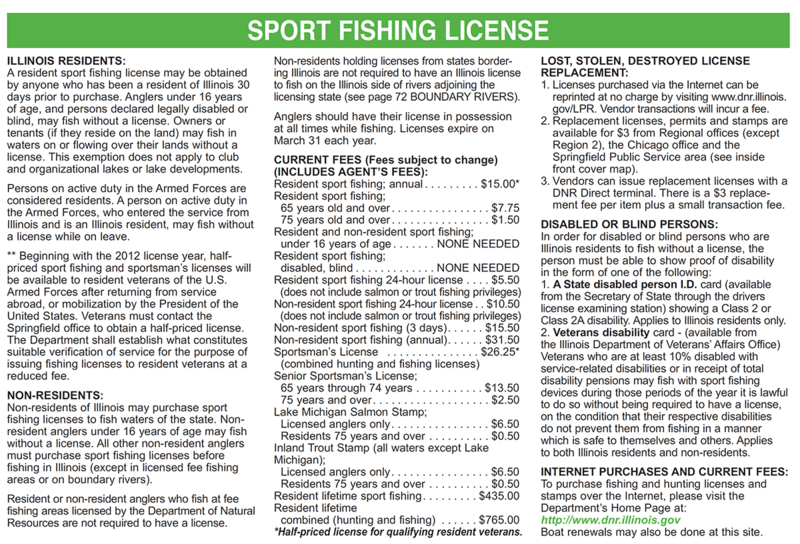 Fishing in these areas is governed by the Illinois Department of Natural Resources (IDNR), as summarized below, with IDNR fishing licenses required for anyone 16 years of age or older. Fishing Licenses are available for purchase at the MPOA office. Source: https://www.dnr.illinois.gov/fishing/Pages/FishingInformation.aspx The Nippersink Creek stream channel immediately downstream of the Wonder Lake Dam, as well as the Wonder Lake Dam embankment, are also owned by the MPOA, and are posted “No Trespassing”. Anyone found in the dam area / creek will be subject to arrest by the Wonder Lake Police Department. 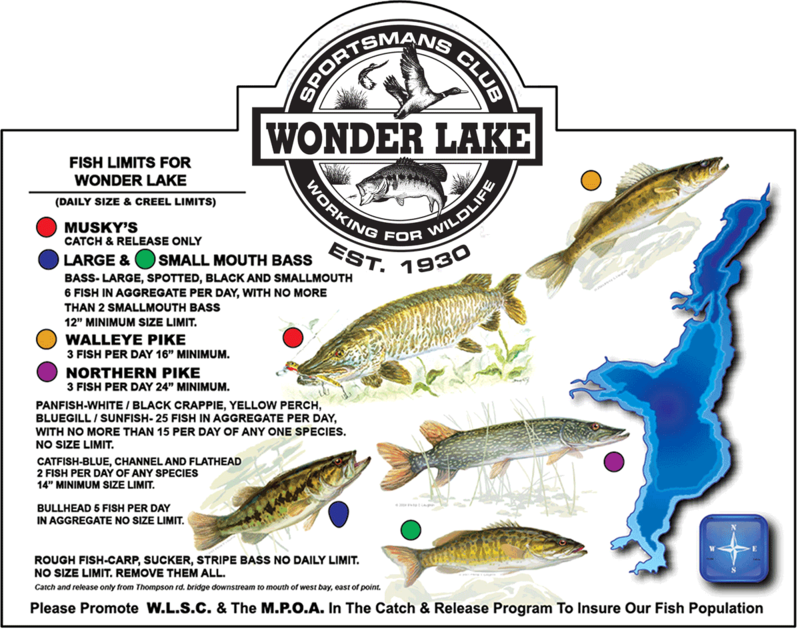 The Wonder Lake Sportsman’s Club takes an active role in managing the Wonder Lake fishery, and regularly updates its recommendations on limits for Wonder Lake / Nippersink Creek. Walleye - (3) fish per day, 16” minimum. Bass - Largemouth, Spotted, Black and Smallmouth -(6) fish in aggregate per day, with no more than (2) Smallmouth Bass. 12” minimum size limit. Panfish - White/Black Crappie, Yellow Perch, Bluegill / Sunfish - (25) fish in aggregate per day, with no more than 15 per day of any one species. No size limit. Catfish - Blue, Channel and Flathead- (2) fish per day of any species. 14” minimum size limit. Bullhead - (5) fish per day in aggregate, no size limit. Rough Fish - Carp, Sucker, Striped Bass - No daily limit. No size limit. Remove them all. All Sport Fish - Catch-and-release only from Thompson Road bridge downstream (east) to mouth of West Bay..